Travel Write Draw: She's so Two-Faced!! The very first project John Jay assigned had us interpret ourselves and our alter-egos in gouache. This proved to be incredibly entertaining. For the first time ever I thought about myself in terms of being a caricature. For the self-portrait I had to include the Meagan Morrison essentials. 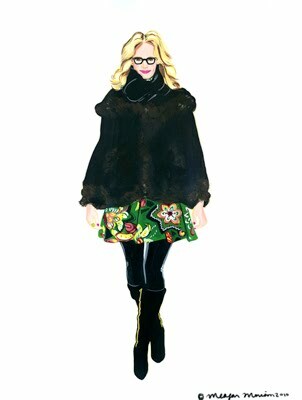 The retro glasses, pink lipstick, and oversized faux-fur coat sort of epitomize my style. My alter-ego, however, was my opportunity to play dress-up and push all the boundaries I've ever wanted. 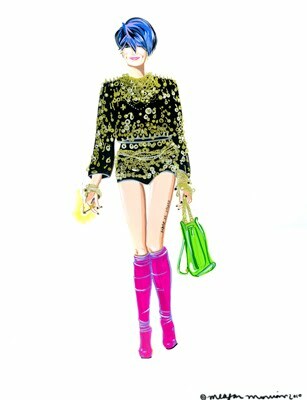 I even dressed myself in Dolce & Gabbana Fall 2010 ( a girl can dream lol!!). The attitude is definitely bang on. For those of you who know me, you've probably encountered her once or twice. Don't worry though, the match was only for dramatic affect.